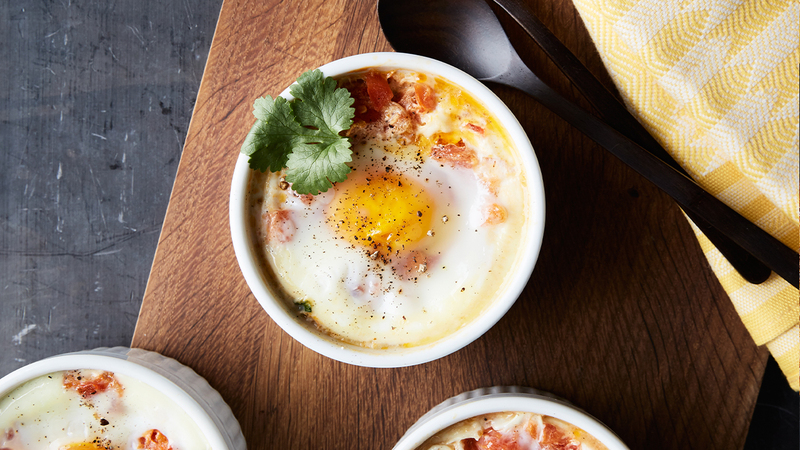 Martha simplifies time-honored recipes to bring a Gulf-style breakfast to your table. She cooks up a feast of traditional dishes: khameer, a date-sweetened bread; shakshouka, a baked egg dish; jebabs, a distant cousin of pancakes; and balaleet, a delicious way to serve an omelet. They may sound unfamiliar but they are sure to become your new morning favorites. This shakshouka recipe appears in the "Arabian Gulf Breakfast" episode of Martha Stewart's Cooking School. Preheat oven to 400 degrees (200 degrees C). Heat 2 teaspoons ghee in a large skillet over medium-high. Gradually add spinach and cook until wilted. Remove to a paper towel-lined plate; set aside. Wipe out the skillet and heat 3 tablespoons ghee over medium-high. Add onion and cook until very soft and translucent, 10 to 12 minutes. Add garlic and cook 5 minutes more. Add tomatoes and red-pepper flakes and cook until tomatoes have broken down and most of the liquid has been absorbed, about 15 minutes. Remove from heat; set aside. Brush four 6-ounce (about 175-milliliter) shallow baking dishes with remaining 1 teaspoon ghee. Divide spinach equally among them, spreading evenly. Top with tomato mixture, creating a well in the center. Crack an egg into each well. Season egg with salt and pepper. Place baking dishes on a baking sheet and transfer to the oven. Bake until the egg yolks are soft and egg whites are opaque, 15 to 18 minutes. Serve topped with a pinch of black pepper and cilantro, if desired.